1. Kat Von D - Tattoo Liner // Shade + Light Contour Palette. 2. Hourglass - Ambient Lighting Palette. 3. Tarte - Deluxe Cheek Stain // Amazonian Clay Blush. 4. Anastasia - Brow Wiz. 5. Bumble and Bumble - Surf Spray. Just in case I haven't mentioned it enough in my day to day life and via social media, I'm going to New York in 18 freaking days. That's just a little over two weeks. That is freaking cray cray. We booked the tickets way back in January, and now it's here. I feel like we blinked and now it's just around the corner. In the last couple of months we semi curbed our completely reckless spending and somehow managed to save up some $$$$$. 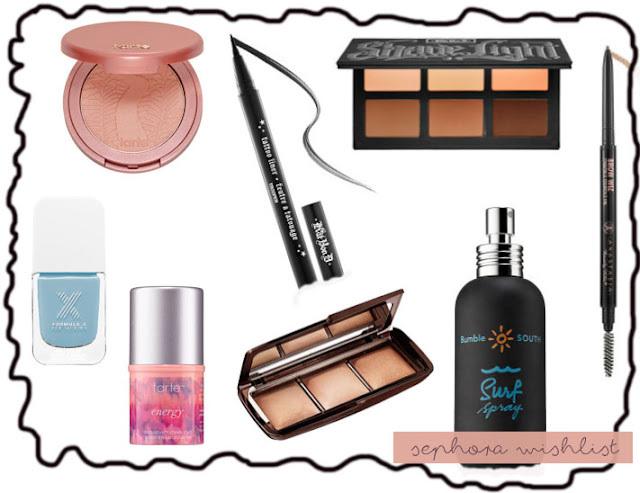 Our eyes, are fixed on one store only and that store is none other than, (yeh, you guessed it) - Sephora. *queue angels singing*. Yass, I'm excited to enter the heaven, the holy alter, the dream, that is Sephora. My wishlist is long. It may be, .. too long but yano what?! I look forward to blowing my hard earned cash on items that I on some deep (very deep) level, could probably live without, but for some reason, feel like I can't. This isn't my entire Sephora wishlist, I have a few more things from Anastasia (lipstickss) that I kind of fancy that aren't on the website which has me a little worried, but it's okay, we'll deal with that issue when it comes to it. I also have a whole drugstore wishlist, consisting of absolutely everything from the L'oreal Infallible collection. I've had my eye on the setting spray for weeks now, I may buy two. Wow am I going to go wild or what? This isn't even thinking about clothes from Victora Secret or Pacsun and all the bath things I'm going to buy in Bath and Body Works. Pray for me and my overweight suitcase please? Do you guys have any must haves from Sephora?? I feel like I'm missing some big item but idk. Nice wishlist. I am 100% lusting after that hourglass palette but I could never justify it! I love the brow wiz, you have to try it! That hourglass pallette is to die for, so beautiful! have a great time in new york! if i was bound for the states i would probably pick up some tarte and kay von d things! I hope you have an amazing time! !